Two stadiums, for the first time ever, dominated both the Jury Vote and Public Vote in this year’s Stadium of the Year. 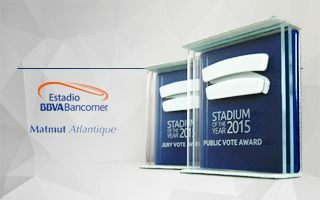 They only switched places: Estadio BBVA Bancomer won the praise of 37,677 internet users, while Matmut Atlantique was ranked higher by our fantastic Jury. Now we’re sending specially molded statuettes, created from fused glass, to both the winners. They should arrive in France and Mexico in upcoming days.